The VIX, or Volatility Index, can be used to time your trades to the market. This market timing system was developed by Larry Connors and has become known as Connors VIX Reversals. It is used to identify when the overall market (S&P 500) is likely to reverse. Keep an eye on this indicator and use it in addition to your regular market timing strategy. The Volatility Index (VIX) measures future volatility. It provides us with a good indication of the level of fear and greed in the market. Volatility is mean reverting. This means that periods of high volatility will eventually revert to their mean and periods of low volatility will eventually rise to their mean. High readings usually occur after a market sell-off and you will want to be focusing on long positions. Low readings usually occur after a rally and you want to be focusing on short positions. We always do the opposite of the crowd! The first one uses the 10 period moving average. You can see this moving average on the chart above. When the VIX gets 10% above the 10 period moving average, the S&P 500 will be selling off. It has reached an extreme and will be likely to reverse back to the upside. You want to be looking for long setups because this has correctly predicted market direction nearly 70% of the time! This is the opposite for short setups. 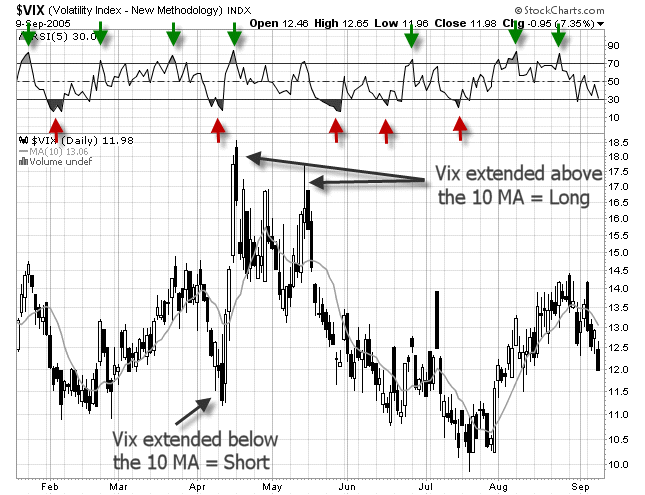 Look for the VIX to get 10% below the 10 period moving average to look for short setups. The second one uses the RSI indicator with a 5 period setting (see chart above). When the RSI gets above 70 the VIX is overbought and the market is oversold. Look for long setups. When the RSI gets below 30 the VIX is oversold and the market is overbought. Look for short setups. I have marked the chart above in the RSI panel with green and red arrows to show you the long and short signals. Remember that the VIX reversals are used to identify market extremes in the S&P 500. So in order for these signals to be significant, you will want to use them to trade this index itself (SPY) or find charts of stocks that look similar to the chart of the S&P 500. Read more about these VIX reversals (and quite a few other short term trading strategies) in the book, Short Term Trading Strategies That Work . Once you start to learn the VIX reversals, and begin to see how often the market actually reverses when you get multiple signals all pointing in the same direction, you will realize just how valuable this knowledge is. You will also gain an enormous edge over other traders!